Grand College – WordPress Theme For Education. 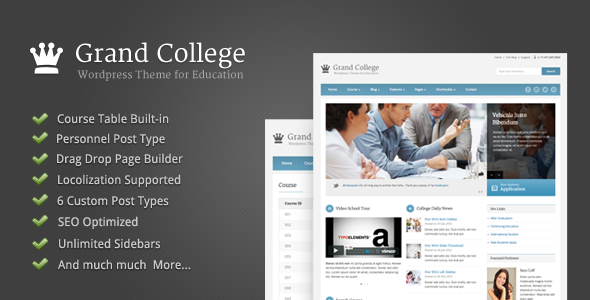 Grand College is the best theme for School, University, College or even your business. It’s clean and modern designed with well crafted. You can change almost every elements color easily via admin panel. Page items are managed very easily via our awesome tool, ‘Page Builder’. Admin panel in this theme is a real feature rich. You can also create unlimited sidebar, choosing over 450 fonts or if you want to use your own, we provide a cufon uploader. SEOWe reconstructed about how to use title. We use heading tag(H1,H2,H3,…) for title which is good practice for search engine site. Main contents are moved above sidebars(including both sidebar layout), now search engine will easily fine your main contents first. Also, ‘alt’ tag for images is supported. This is also help search engine to analyst your site easily. Share the post "Grand College – WordPress Theme For Education"